Moving OFTEN or WELL…which is more important? In 2008, after I’d been practicing Tang Soo Do Karate for several years but was still only a Red Belt, I took first place for “Forms” in an annual national karate championship at Tropicana Casino & Resort in Atlantic City…I swept the entire division of women my age, all of whom had been Black Belts most of their lives, and it was one of the biggest rushes of my life (second only to the birth of my beautiful daughter Kirsti.) I felt SO PROUD while standing on the podium to receive my medal and trophy (which was almost as tall as me BTW!) and it was pretty much clear to all the competitors, judges, and spectators in the place that I’d basically CRUSHED my competition. Imagine my surprise, then, when only a couple months later, while participating in an internship program focusing exclusively on functional movement & fitness, I utterly FLUNKED something called the Y Balance Test. Now although it would’ve be inaccurate to describe me as a professional or even a high-level athlete back then, it was definitely the case that I was pretty accomplished in a particular sport. And at that time I also appeared to have almost superhuman balance so there was a great deal of evidence to suggest I’d ACE the Y Balance Test. But I digress…instead of following that story down an entirely different rabbit hole, let’s flash forward to last week when I read a great article in the Delaware News Journal about Von Homer, a Visiting Assistant Professor working towards his second doctorate in Neuroscience via his research and work within Delaware State University’s Department of Public & Allied Health Sciences. In Balancing Risk I read that Homer has combined the Y Balance Test (or YBT) with an electromyography test (or EMG - tiny electrodes placed on various muscles) to create a unique new injury-risk prediction tool called “The Homer Technique”…Homer and the other researchers feel this new technique could have a major impact on athletic shoe design, could be used by health insurance companies, and could even inform athletic personnel decisions within the NFL and various other sports teams. The YBT is quite simple…it takes only about 15 minutes to perform and the equipment looks like a Y when lying on the floor (thus the name.) The participant stands / balances on one foot at the "intersection" then reaches as far as possible with the other foot in three different directions: forwards (or into the anterior plane), to the back / away from the body (or postero-laterally), and then to the back / across the body (or postero-medially.) 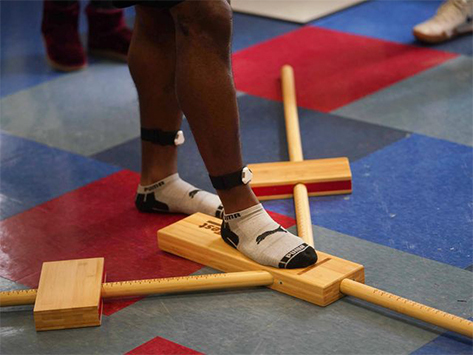 The test is great for measuring someone’s strength, stability, and balance in all areas of the body while reaching in various directions. But what sets the Homer Technique apart from the standard YBT, however, are the little EMG electrodes which supposedly pinpoint specific dysfunctional muscles…the article pointed out that information gathered from the Homer Technique will enable exercise professionals to design more targeted exercise programs (focusing on increasing stability, strength, and mobility of specific muscles) rather than generalized strength and conditioning programs for their clients. I wonder, however, if all this isn’t turning exercise into brain surgery when it really should be a no-brainer (at least for highly qualified health & fitness professionals!)? Did you know that there’s really only seven big movement patterns the human body can execute? Yup…turns out that all human movements, from the smallest to the most complex, are nothing more than variations of these seven Pillars of Human Movement: squat, lunge, push, pull, bend, twist & gait. If Personal Training really isn’t your thing, though, but you’re definitely interested in learning more about functional movement, I do have another tool in my bag of tricks that’s bound to peak your interest…my next Functional fitness for ANY body class is just around the corner and, as the name implies, it’s perfect for literally anybody from the exercise novice to the full-blown gym rat! Here’s why: remember those seven major movement patterns? Well, for each one of those patterns there’s an entire continuum of exercises ranging from the simplest to the most complex. So no matter what’s going on with your body, as long as you incorporate some exercise from each of those seven essential movement patterns THAT YOU CAN PERFORM PROPERLY (this is key), you’ll be getting in a good workout (in other words, moving well) every time you exercise. And think about the words “functional fitness” for a moment…what we’re really talking about here is improving your ability to function not just while doing something extreme (like winning a national karate championship) but within the context of your ADL’s (Activities of Daily Life.) For example, consider how often throughout the day you squat (remember that’s one of the Pillars of Human Movement)…don’t sitting down then getting back up off of the toilet, getting in and out of your car, or picking heavy grocery bags up off the ground all qualify? Now go ahead and Google the word “fit”…I bet a bunch of scientific definitions popped right up! But don’t you agree that in the end being able to perform all your favorite activities enthusiastically and without pain for the rest of your life is all that counts? So if you’re starting to wonder whether a gym membership is required for someone to become functionally fit you’re right on target…one aspect of my coaching style which really sets me apart from the crowd is that I teach my clients EASY ways to get and stay fit with little or no equipment. Remember that no matter where you go you always have the very best “machine” with you…YOUR BODY! So sign up for Functional fitness for ANY body today (I’m not kidding, today…classes fill up FAST) and I hope to see you all there!